Michael Johnson was a pioneer of colour field painting in Australia, having witnessed it first-hand overseas in the 1960s. From this time his work was primarily concerned with colour and the manipulation of spatial planes through colour relationships. He exhibited at Sydney’s Central Street Gallery, as well as being included in 'The field', the National Gallery of Victoria's ground-breaking exhibition of 1968 that was the first comprehensive survey of Australian hard edge and colour field work. 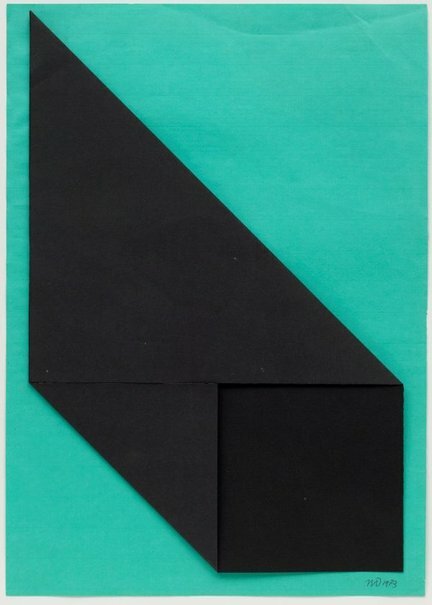 Geometry was secondary to Johnson’s primary interest – colour - which he approached in an intuitive, experimental way in order to observe its power to change (its 'mutability') through placement and juxtaposition with others. He was using raw, unmixed colour in his painting at the time; similarly, these minimalist collages from the early 1970s use contrasting pure tones of commercial coloured paper folded and placed to create geometric form. Johnson wrote in 2014: "History might isolate geometric abstraction as a style moment or sensation. But my work at that time was operating like a zebra stripe: playing with camouflage, combining geometry, form and contrast to play with light and scale…. In that time I did not mix colour or work tonally. Every hue is its own entity, raw yet mutable, and every composition is the place where my perception of colour is shocked back into recognition” (Michael Johnson ‘Colour notes’ in 'Michael Johnson: London Sydney New York, paintings and works on paper 1960s & 1970s', Annette Larkin Fine Art, Sydney, 2014, pg.3). Signed with initials and dated l.r. corner, pencil "MJ 1973". Michael Johnson: London, Sydney, New York. Paintings and works on paper 1960s & 1970s , Waterloo, 2014, 16. col. illus.